Organic skincare based on donkey's milk. Welcome to Anakaé®, natural and organic donkey's milk cosmetic products. By combining the exceptional virtues of donkey milk, known since ancient times, with high quality natural preparations, we want to offer your skin the best. The best of milks, hand-milked from our donkeys. They are raised in the open air all year round and only breed once every three years. Milk rich in vitamins A, B1, B2, B6, D, C, E, minerals and trace elements (zinc, iron, calcium, potassium, phosphorus, magnesium). Donkey’s milk is the closest in composition to breast-milk. It has regenerating and stimulating power. The best from nature : our creams contain from 80 to 99% natural and organic ingredients. A unique combination in the field of organic cosmetics, which conferes to Anakae beauty-care (ou skin-care) formulae (ou formulas) a unique sense of well-being. A sensation we invite you to discover through our range. 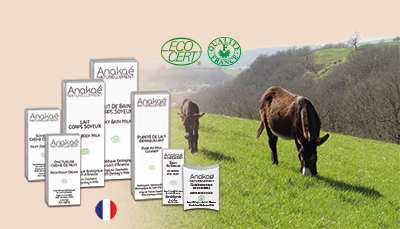 Anakaé®, french manufacturer of organic donkey milk cosmetics, certified by "Ecocert Greenlife" and "Quality France". Our donkey milk natural cosmetics are made within a framework respecting nature, man and animal. --> See our certified organic donkey milk creams, milks and soap .